We won't let a printer out the factory door if it hasn't passed our exhaustive calibration and test procedures. 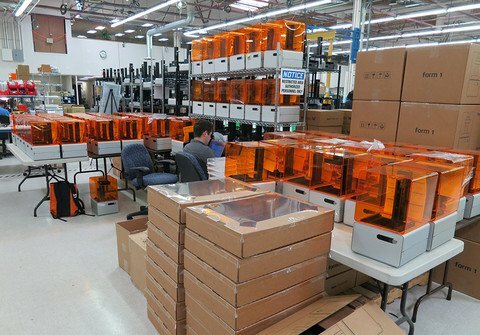 This commitment to quality has caused delays in our shipping schedule, but the Form 1 will be better for it. Printers are shipping continuously, but our factory is not yet operating at full speed due to our quality assurance process. Every printer must go through an extensive calibration procedure and pass a rigorous print test before shipping. Many printers do not pass, which requires recalibration and sometimes component replacements. The majority of our engineering team is now focused on optimizing these final steps to get printers shipping faster. As of now, we have more than 700 fully-assembled machines in line to be calibrated and tested. We have already fulfilled the first levels of our Kickstarter campaign, and are continuing to ship printers every day. Our current estimates have us shipping Kickstarter orders by the end of the summer. You can see our first backers discussing their prints in our support forums. We know many of you have been waiting for months to get your hands on the Form 1 and start printing. We really do appreciate your patience in this process. We're serious about creating a reliable, professional-grade 3D printer, and we won't compromise on quality.